A small cylindrical object fell on the roof of a nursery school in Okinawa when a U.S. military aircraft flew over on Thursday morning, local and central government officials said. 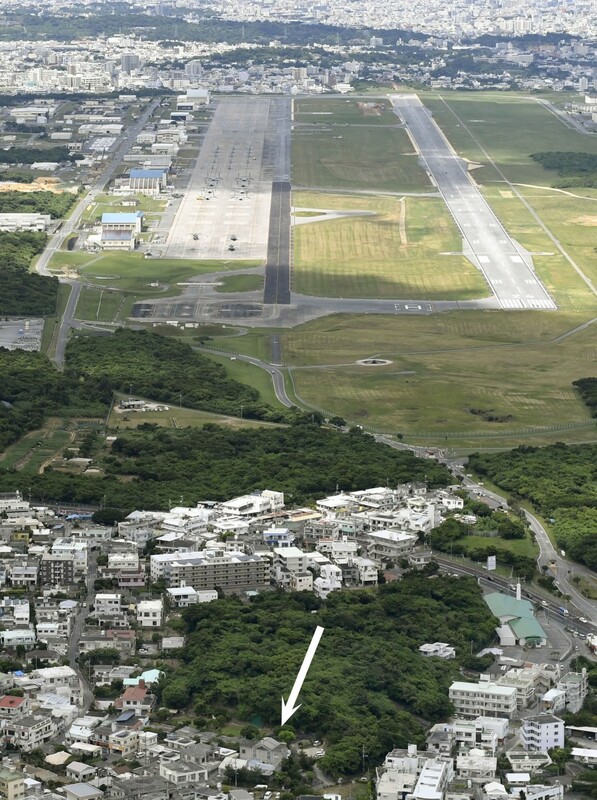 There were no reports of injury from the incident, which occurred about 300 meters from U.S. Marine Corps Air Station Futenma that sits in the middle of a densely populated residential area in Ginowan. Defense Minister Itsunori Onodera said in Tokyo that the local defense bureau is asking the U.S. Marine Corps in Okinawa to confirm the object and other facts, adding, "We think this kind of incident stirs concerns among the people in Okinawa." A government source said the U.S. military CH-53 transport helicopter was flying in the area when the incident took place at about 10:20 a.m. The chopper had left Futenma base about five minutes earlier and was heading in the direction of the nursery school. According to the nursery school, about 50 children were playing in its grounds while eight toddlers and two caregivers were inside the building when they heard a loud sound indicating something had fallen. The local police and the Okinawa government said the cylindrical object was about 9.5 centimeters long and about 7.5 cm in diameter. It appeared to be a plastic cover of an instrument used to detect the condition of helicopter rotor blades. English writing on the object stated it should be removed before flight. An officer of the U.S. Marine Corps told Kyodo News that it is taking the reports of an object found on the roof of the nursery school "very seriously" and "investigating this incident." "We care deeply about the safety of our friends and neighbors in the communities around which we live and operate. We will provide more information as it becomes available," the officer said. Okinawa Gov. Takeshi Onaga separately said, "One wrong move and somebody could have got injured or died. We think this is a serious accident." Take Nago, the 78-year-old chief caregiver at the nursery facility, said, "I'm appalled to think what would have happened if it had fallen instead just a little bit from where it did." The Japanese and U.S. governments have been pushing a plan for the relocation of the Futenma base from Ginowan to the less populated Henoko coastal district of Nago, also in Okinawa Prefecture. The relocation is intended to remove the dangers posed by the Futenma base. But Onaga and many other people in Okinawa, which hosts the bulk of U.S. military facilities in Japan, want the Futenma base to be removed from the prefecture altogether. Okinawans are frustrated with noise, crime and accidents linked to U.S. bases. Safety concerns were recently rekindled by a series of accidents involving U.S. Marines Osprey aircraft and another CH-53 helicopter that belong to the Futenma base. In October, a CH-53 burst into flames as it made an emergency landing near the U.S. military's Northern Training Area in Okinawa. None of the seven crew members or local residents was hurt in the accident. Meanwhile, a U.S. military C-130 transport aircraft assigned to the Yokota Air Base in western Tokyo was found to have lost parts from equipment to release flares, the Tokyo metropolitan government said Thursday. The Tokyo government said it was informed of the incident by the local defense bureau and lodged a protest with officials at the U.S. base.